Shannon Lawrence's flash fiction piece, "The Family Ruins," was released in April 2013 by Chuffed Buff Books as part of its Sunday Snaps: The Stories anthology (ISBN: 978-1908858016, paperback, 128 pages, ebook forthcoming). The anthology is available at Amazon, Chuffed Buff Books, or The Book Depository. The author's website is at www.thewarriormuse.com. This quirky collection contains short stories, flash fiction, vignettes and poetry in various genres. 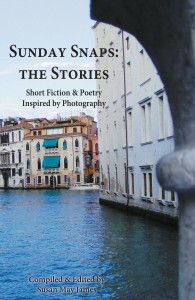 It developed over the course of 52 weeks whereby a series of ‘Sunday Snaps’ served as inspirational writing prompts. The result: an eclectic assortment of light-hearted comedy, romance, dark tales, tragedy, slice-of-life stories and expressive verse. While the spires of Milan Cathedral provide the backdrop to romance, elsewhere a woman rushes to the side of a life-long friend. With a spiteful kitty, a mother’s pact with the devil, a birthday kiss and a dash of supernatural revenge, this unique collection offers a tale for all! Shannon Lawrence spends her time in the dungeon writing, often accompanied by her familiar, and occasionally her two small minions, who both inspire her and insure her writing time is limited. Her horror short story, "The Blue Mist," will appear in Nightfall Magazine in March 2014. She is active in her local writing community, and works as Flash Fiction Chair for the Pikes Peak Pen Women, Managing Editor of Writing From the Peak (official blog of Pikes Peak Writers), and Director of NCE for Pikes Peak Writers. I love the concept of this book. Photos so inspire my writing and evoke feelings and thoughts. Thanks for sharing it. Thank you, Julie, Stacy, and Frank! It was definitely a fun idea, and I always love writing to a prompt. It frees the mind to write whatever pops into it. Welcome to the official blog of Pikes Peak Writers. We aim to inform, educate, enrich, and entertain writers. NOTE: The posts appearing on this blog may not be reposted or reprinted without the express permission of the author and Pikes Peak Writers. Help an Author Out — Leave a Review, Please! Ergonomics for Writers Part One: Quit Slouching!